One of my science fiction stories in progress centers on global loss of internet and cell phone access after atmospheric changes. How would we communicate with one another? What news would we hear? Who would we believe? I hadn’t thought of it as a tool for repression until now, following the revolution in Egypt. I didn’t realize this was a freedom government could actually block, but the news this weekend showed that it is. 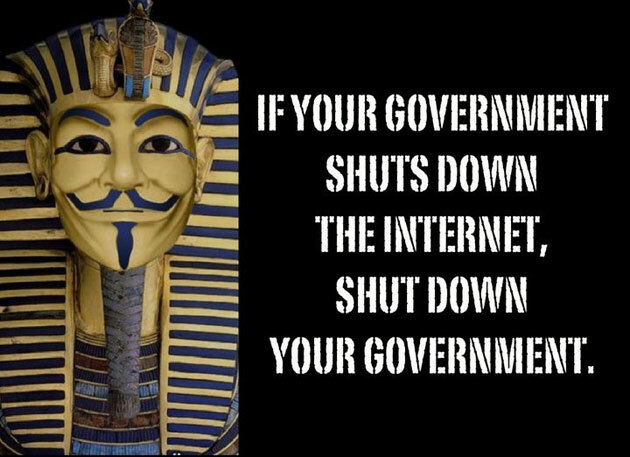 This image was up at Mother Jones today, picked up from Reddit, along with descriptions of the people’s revolution, the retaliation of internet and cell phone shut downs by the government, and vandalism of the Cairo museum artifacts. The reference is to the movie V for Vendetta’s mask and historical Guy Fawkes, jarring superimposed on the king’s mask. Egypt, beautiful Egypt of friends, of family, of our heritage and art, pyramids and gods. What do you think about freedom of speech and assembly during revolutions? Thanks for sharing your views, it does seem the government must evolve but that this happens slowly and often not according to our needs but to those in power. Very horrifying to imagine communication cutoff as a form of repression. Thanks for touching on this subject, Jennifer. Almost the entire world relies on the Internet and cell phones. You ask great questions, and you’re right: “Who would we believe?” Imagine being cut off from your loved ones like that? I think it is important for the rest of the world to know what is going on with your revolution, so you aren’t left with a feeling of abandonment. With the revolution in Tunisia it was widely covered on Twitter, and elsewhere and it helped spur the revolution in Egypt. So, the right to freedom of assembly over the web, and the right to make your voice heard virally is becoming ever increasingly vital to sustaining your movement. If you aren’t covered on the web I think it is possibly a kind of death for your movement. Thanks for these great examples where freedom of speech and assembly were so necessary. It seems strange to see these rights openly disregarded today. Crucial, a fundamental human right, central to social and political change and especially important when people don’t have access to other means of political protest (e.g. the Covenanters in 17th century Scotland, France in 1789, the US First Amendment, the German states in 1848, Russia in 1917, Europe in the 1990s).